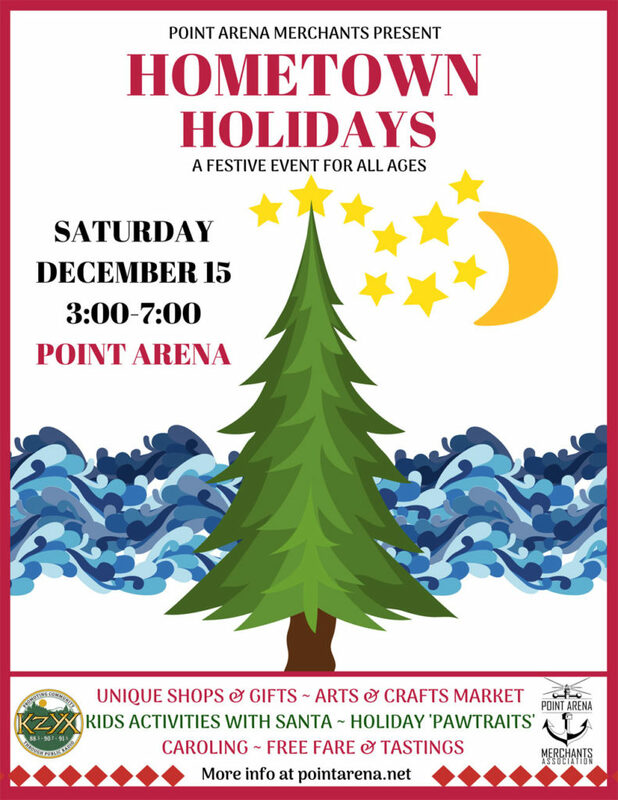 Point Arena is the place to celebrate the season! Join Hometown Holidays festivities on Saturday, December 15, from 3:00-7:00. Sponsored by the Point Arena Merchants Association. Shops, galleries and an Arts & Crafts Pop-Up Market will offer unique holiday gifts, special discounts and festive foods. Restaurants will offer holiday specials to diners with a purchase receipt from the event. Inside 250 Main, the Arts & Crafts Pop-Up Market will offer an array of handcrafted jewelry, leather goods, pottery, artwork, wreaths, fiber arts and clothing. At their Main Street location, Action Network will host children’s activities and provide snacks, allowing parents to shop child free. Santa is expected to drop in for the fun! Arena Theater offers events throughout the day. At 9:55 a.m., a new production of La Traviata will keep viewers spellbound. At 3:30 Gualala Dance Studio’s ‘Winter Showcase’ is featured. At 7:00 p.m. the new movie version of Dr. Seuss’ classic, The Grinch, is sure to delight all ages. The Redwood Credit Union will host a holiday open-house with a gift basket raffle from 3:00 – 6:00; with goodies, hot cocoa and hot cider. Outside, on Main Street, PawPawrazzi Pet Photography will snap the perfect holiday ‘pawtrait’ of you and your pet, between 4:00-5:00. At 5:00 there will be a tree lighting ceremony at Centennial Plaza, just north of Arena Theater. Join in the fun and sing “Oh Christmas Tree” with the Hometown Holiday Carolers. The caroling will continue along Main Street until 6:00. Merchants on Main Street and Arena Cove, along with The River Grill at Garcia River Casino will offer special discounts as well as complimentary appetizers and beverages. The Coast Highway Artists Collective will host a holiday gift show with featured artists Lena Bullamore, Gretchen Barton and Peri Ness Defay. Step in to Roots Herbal Apothecary for tea tasting, treats and a 15% holiday discount on luxurious organic bath and body products, tea blends, apparel and gifts. The coffee lover on your list will be delighted by the offerings at Little Green Bean, our local roastery. Enjoy hot chocolate or an eggnog cold brew while you shop with a 10% discount, storewide. For the motorcyclist on your list, The Zen House, located in the Point Arena Garage, is offering 30% off tires, 20% off protective gear and apparel, and 10% off all other merchandise. Shop while enjoying holiday hors d’oeuvres with spiced mulled wine (Danish Glogg) to add to your holiday spirit! The ‘foodie’ on your list will want you to visit Lisa’s Luscious Kitchen, located on the south end of town. Lisa will offer complimentary homemade Chai Tea along with tastings of her delectable jams and marmalades, chutneys, cooking oils, infused fruit vinegars and fruit sauces. Also located on the south end of Point Arena, you’ll find The Green Room, a boutique dispensary, selling both recreational and medical cannabis. They are celebrating Hometown Holidays with a 15% off storewide sale. Arena Market and Café will offer samplings of tasty holiday treats and gift certificates for a free 12 oz. hot drink of choice with every purchase of $25 or above. Point Arena General Store will offer samplings of tasty holiday treats and one free pizza giveaway every half hour during the event (must be present to win). To pamper that ‘special someone’ on your list, visit Skinluv to purchase a gift certificate. Skinluv is now a full-service salon for hair, skin, tatoo and massage. Franny’s Cup & Saucer will stay open late for the event, offering peppermint mushroom truffles, gingerbread men, stollen and California fruitcake to shoppers of their unique gifts and baked goods. 215 Main will offer holiday hors d’oeuvres during the event, followed by Middle Children playing apocalyptic surf rock music from 8:00 – 11:00. Come out and dance! Feeling hungry after all the fun? For diners with a receipt from a local merchant dated 12/15, restaurants will offer a special Hometown Holidays 20% discount on meals. Participating restaurants are the Pier Chowder House and Tap Room and Uneda Eat Pizza (at Arena Cove), The River Grill (at Garcia River Casino) and Rollerville Café (on Hwy 1). The newly open Point Arena Café will join in the offer, extending their hours with a special dinner menu for the event. Unbeaten Path Tours & Yoga is offering an Unbeaten Holiday discount on Tour & Yoga Gift Certificates. Reference “Hometown Holidays 2018” and receive 10% off your Unbeaten Gift Certificate purchase from December 15th through December 25th, 2018. Purchasers receive the added bonus of 1 Free Pass to any Unbeaten Yoga Wednesday Class trial at Gualala Dance Studio (1 Free Pass per gift certificate). Buy online at www.unbeatenpathtours.com. Have fun, get festive, eat well and finish your holiday shopping locally, at Hometown Holidays!